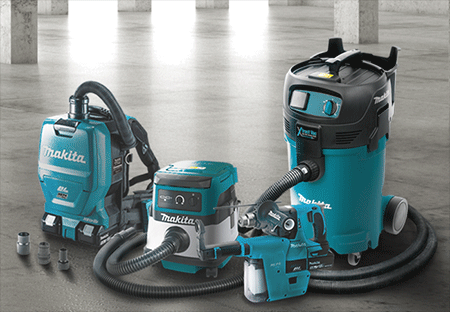 From the integrated convenience of the XRH01 used with DX01 On-Board Dust Extractor to the peak-performance and versatility of the VC4710 12 gallon Xtract Vac, Makita offers a robust-line of dust management solutions designed to meet your application needs. 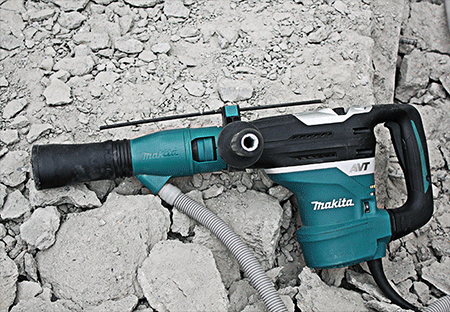 With both corded and cordless options, Makita delivers innovative and flexible technology that allows you to work effectively while reducing concrete silica dust on the job site. The XCV08Z, 18V X2 LXT® (36V) 2.1 Gal. HEPA Filter Dust Extractor is equipped with Auto-start Wireless System (AWS™) which uses Bluetooth® technology for wireless power-on/off communication with the AWS™ -equipped tool. 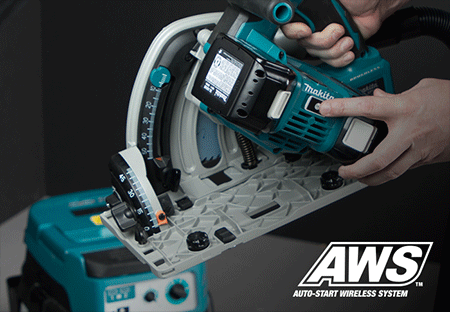 AWS™ is intelligent communication that increases productivity by allowing cordless powertools to wirelessly communicate power-on/off with the dust extractor and eliminate the need to manually handle the power switch. Additionally AWS™ reduces continuous noise by automatically shutting off the dust extractor when power trigger is released. The XCV08Z is powered by two 18V LXT® batteries for 36V power and run-time, without leaving the 18V LXT® battery platform. It has an efficient three-stage HEPA filtration system that captures 99.97% of particulates .3 microns and larger. Makita-built brushless motor delivers longer run time, increased power and longer service life. Using two 18V batteries (sold separately), the XCV08Z delivers up to 75 minutes of continuous run time on low setting and 40 minutes on high setting, with 74 CFM and 39” water lift of suction. The Xtract Vac® (model VC4710) is at the center of Makita's growing dust collection system, and with an extensive range of features the VC4710 is a top performer in the jobsite vacuum category. This is a best-in-class solution for dust extraction in concrete and woodworking applications. The VC4710 is powered by a 12 AMP motor that generates 135 CFM of suction power and 92" of water lift to take on the most challenging applications. In addition, precision lightweight motor components and more efficient air ducting allowed engineers to reduce the weight to only 27 lbs. For improved stability, the VC4710 has wide-set urethane rear wheels and enlarged steel caster front wheels to create a lower center of gravity for improved stability and easier movement. The Makita 18V X2 LXT® Lithium-Ion (36V) Brushless Cordless 1/2 Gallon HEPA Filter Backpack Dry Dust Extractor/Vacuum is a powerful and portable clean-up solution that eliminates extension cords that trail corded backpack vacuums. It's also a powerful and portable dust extraction solution for contractors that bridges the gap between low-capacity on-board dust extraction systems and larger capacity but less portable wheeled canister job site vacuums. The XCV05 Backpack Dust Extractor is ideal for cleaning crews, as well as for construction applications when used as part of a dust extraction system (tool connecting adapters sold separately). 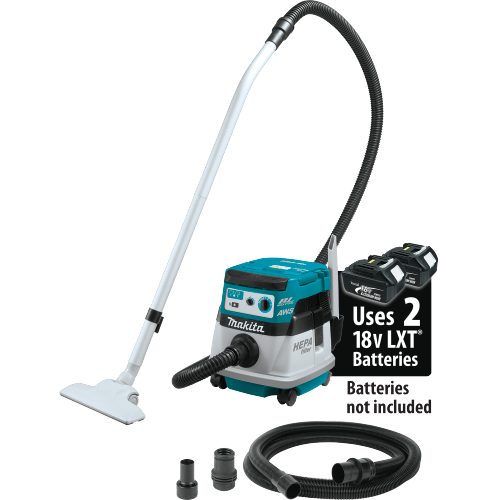 Clean-ups just got easier with the Makita 18V X2 LXT® Lithium-Ion (36V) Cordless/Corded 2.1 Gallon Dry Vacuum. The XCV04Z (tool only) offers corded or cordless operation for maximum versatility and convenience. In cordless operation, the XCV04Z is powered by two 18V LXT® batteries for 36V power and run-time, without leaving the 18V LXT® battery platform. Using two 18V 5.0Ah batteries (sold separately), the XCV04Z delivers up to 65 minutes of continuous run time on low setting and 30 minutes on high setting, with 74 CFM and 36” water lift of suction. The versatility to plug in the cord and achieve higher suction power at 127CFM and 96" of water lift, makes XCV04Z the perfect solution to meet all your application needs. The 18V LXT® Lithium-Ion Brushless 1” Rotary Hammer with HEPA Dust Extractor Attachment (model XRH011TX) combines Makita BL™ Brushless Motor Technology with concrete dust extraction - without the cord. The HEPA Dust Extraction Vacuum Attachment is trigger-activated for user convenience. The rubber suction gasket is engineered to provide consistent contact with the work surface, where the dust is channeled to the clear dust container with HEPA filter, which captures 99.97% of dust particles (size .3 microns). An added feature is a 2-second delay on the vacuum motor: After the trigger is released, the 2-second extended suction collects remnant dust and particles as the bit is being pulled out of the work surface, making the XRH011TX ideal for overhead drilling. Continuous Use (max, in minutes)75 min. Net Weight (with batteries)18.4 lbs. Dimensions15" x 17-3/4" x 29-5/8"
Continuous Use (max, in minutes)*90 min. XCV05PT Includes: Cleaning accessories, (2) BL1850B batteries and (1) DC18RD dual-port charger. Continuous Use (max, in minutes)**65 min. Net Weight (with batteries)21.8 lbs. *XCV04 Dust extractor must be utilized in AC mode (plugged into power outlet) in order to achieve 127 CFM and 96" of water lift. XRH011TX Includes: DX01 dust extractor attachment, (2) BL1850B batteries and (1) DC18RC charger. 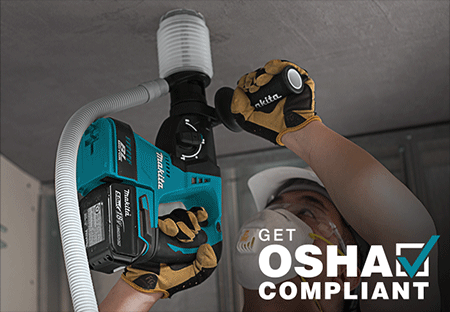 *Compliant under Option 2, Objective Data of the OSHA standard for Occupational Exposure to Respirable Crystalline Silica (rule 1926.1153) when dust extractor is operated with the tested tool model and operated under conditions tested by Makita®. To see the test procedures go to makitatools.com/dustmanagement.